This Ayurvedic intensive is all about food and gut health! It will be a very hands on experience! We will be eating, drinking, cooking, and discovering amazing things about our gut health and how to take care of it for optimal vibrancy and energy! This class will teach you how to approach digestive health from a whole new perspective, teaching you tricks and tools you will use for the rest of your life. In Ayurveda the Sankrit word, “Agni” refers to our appetite, digestive fire, metabolism, and ability to absorb and assimilate the nutrition, as well as emotions and life experiences. When agni is strong: we feel energized, have a good appetite for healthy foods, eat to satisfaction, and feel pleasant afterwards with smooth digestion and elimination. We feel ready and confident for life’s challenges. When agni is weak or compromised: we may feel heavy, lethargic, anxious, depressed, have unhealthy cravings, and feel bloated, gassy, or acidic after eating, and have irregular elimination. We may feel lack of self-esteem about our body, our decisions, or about life in general. Note: Participation at the Ayurvedic Intensive, Part 1 is not required for attendance at this class. But please let the teacher know if you are a new student to Ayurveda, and we will get correct information to you in advance, so you can get the most from class! · Learn which herbs and foods increase digestive fire and when to take them. This workshop is for students and teachers who are seeking to deepen their knowledge and practice. This workshop can be used as continuing education, and also counts towards Yoga Baum’s 300-Hour Yoga Teacher Training. Do you love yoga or holistic health and want to take your journey to the next level? Do you feel ready to grow and expand, but not sure what your next step should be? Have you finally found your purpose in the wellness community and want to contribute more? Are you eager to bring new elements to your teaching or other healing profession? Do you feel yourself showing up differently in the world these days and you want to keep going with it? If you answered, “Yes,” to any of these questions, join Sarah Teeple for this weekend intensive all about Ayurveda! What is a Dosha, and how does it affect your body & mind? You believe that the body can heal itself and you want to learn how! Learn the Ayurvedic secrets to ignite your flame and live your most radiant life! Rekindle your fire, burn toxins, and reclaim vibrant health in mind, body, and spirit! 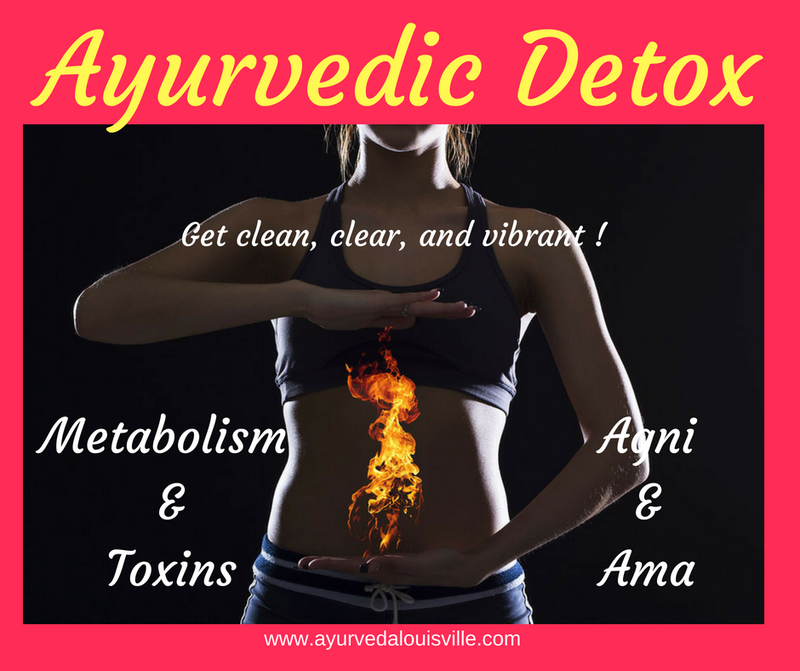 · What is digestive fire and how does it work in the body? · How are toxins stored in the body and how to RELEASE them! · What about metabolizing emotions? · What are some herbs that can help burn toxins? · What foods are best to eat for detoxification at a cellular level? · What are other lifestyle practices to stay clean and clear of toxins? Click the button above to reserve your spot now!! Ayurveda is the sister science to Yoga and one of the original holistic healthcare systems, dating back 3000-5000 years in India. It favors seasonal nutrition, herbs, and lifestyle practices that restore balance tot eh system and heals from the inside out. Ayurveda is a system of natural medicine that treats an individual based on their unique constitution of the 5 great elements (dosha). Everyone is different and so requires different diet, lifestyle, and supplements in order to achieve their highest state of health and happiness! Come learn about dosha and how to feed and tend it, for your optimum wellness and energy in 2018! Sarah Teeple, BA, NC, RYT200 is an Ayurvedic wellness counselor and yoga teacher, specializing in nutrition and lifestyle for optimum holistic wellness. Light, Ayurvedic dinner provided. Investment: $25. 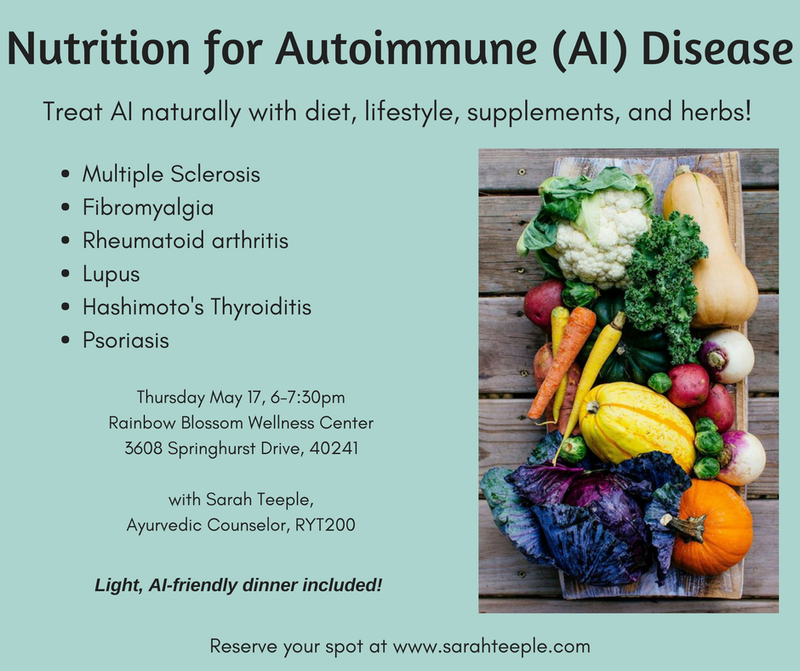 Do you or a loved one suffer from an autoimmune (AI) condition? Western/conventional medicine will tell you that this class of disease is a big mystery, and then slap you a scrip' for a steroid/ immune suppressant pharmaceutical to take for the rest of your life. But that is NOT your only option!! So, stay hopeful! Let me help you become your own health advocate and expert! Learn to naturally manage and even reverse AI, and other inflammation-related conditions, and increase your quality of life exponentially. Ayurveda is the science to yoga and the ancient medical system of India. Looking to nature and the five great elements for their healing wisdom, and using food as medicine, yoga and pranayama, and healing herbs to restore balance to the body, mind, and spirit. 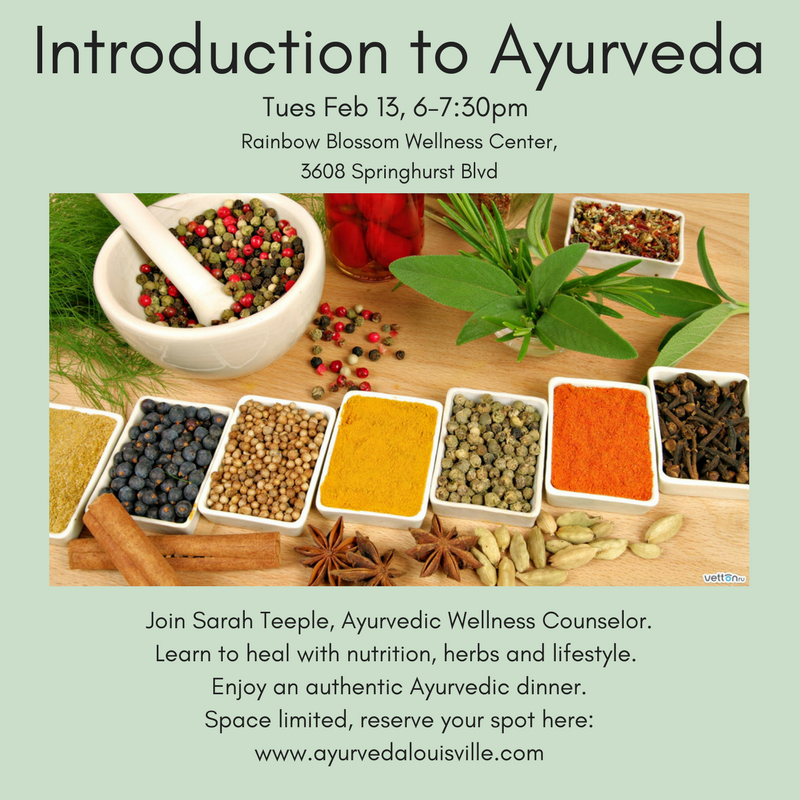 Join Sarah Teeple, RYT200 and Ayurvedic wellness counselor, and learn how to restore balance, vitality, and optimal health using the ancient wisdom of Ayurveda! Tuesday Feb 13, 6-7:30pm. Light, Ayurvedic dinner provided. Class cost $20. Reserve your spot below! Do you experience anxiety, tension, irregular appetite and digestion, bloating and gas, or dry skin and hair? If so, you may be Vata dosha predominant or have some aggravation of the air and ether element. What does this mean, and how can you eat, sleep, move, and LIVE to optimize your dosha? How can Ayurveda can take you to the next level in your holistic health AND your career? Learn more at our intro session, Sat 12/16. Details and sign-up below!